Wild Raspberry is a tall scrambling shrub or climber. The stems are covered with short rusty or white woolly hairs, and armed with numerous recurved prickles. Alternately arranged leaves are broadly ovate- heartshaped, usually 3- or 5-lobed, 3-20 cm long, 2.5-18 cm wide. 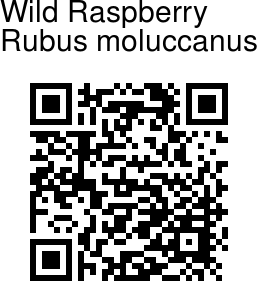 They are hairless or sparsely hairy above, with a crinkled surface. They are densely white or rusty hairy below. Flowers are white, borne in clusters in in upper leaf axils. Sepals are large, velvety, and persist till fruiting. Petals are 5. Fruit is a red berry, about 1.2 cm across. 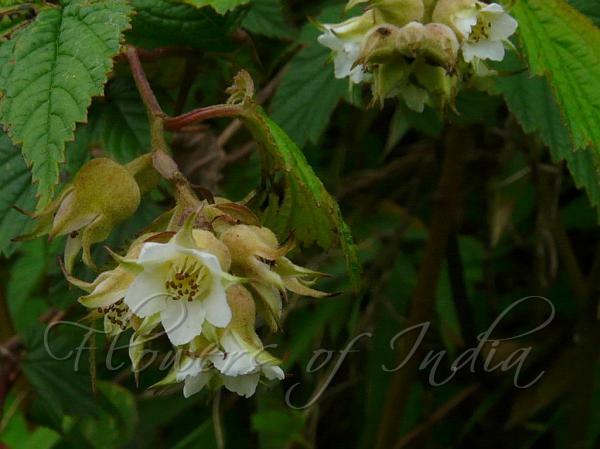 Wild Raspberry is found in NE India, Andaman & Nicobar, and SE Asia. Flowering: April-May. Photographed at Siroi Hill, Manipur & Mizoram.